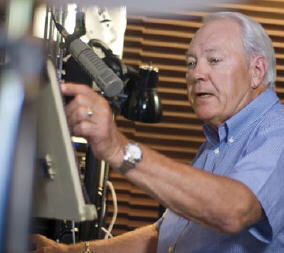 A radio and television broadcaster whose career has spanned more than four decades, Mort Crim has spent a lifetime telling other people’s stories. But in retirement, Crim, who was Paul Harvey’s permanent vacation fill-in and the voice of ABC Radio during the first moon landing, is telling his own story — about surviving cancer and living a full life after the disease. After treatment for both prostate and colon cancer — and supporting his wife, Irene (Renée) Crim, during treatment for breast cancer — Crim says he hopes his experiences can inspire other cancer survivors. He credits Mayo Clinic for his good health today. Crim’s convictions about Mayo Clinic were confirmed when physicians there diagnosed early-stage colon cancer. They were looking for a cause for Crim’s anemia, which was found in a routine blood test. His wife had a similar experience with breast cancer. Her Mayo Clinic physicians detected cancer early and determined it was aggressive. She elected to have a mastectomy and says that attention to detail and proactive treatment are among the reasons she is thriving today. Crim considers his prostate cancer experience noteworthy because of the quality of life after treatment. Concerned about the sexual side effects of prostate removal, Mort consulted with a Mayo Clinic urologist and decided a penile implant would be the best option for him. Ultimately, Crim says, beating cancer was not just about his outcome — but about the team of people around him on the journey. “Mayo Clinic is a wonderful place, and we’re thrilled to be able to have it in our backyard,” says Crim. Today, the Crims are active and healthy. In 2009, Crim, a licensed pilot, completed a cross-country flight to celebrate his 74th birthday. He flew alone in a single-engine Dova Skylark, a light-sport aircraft he dubbed “TWA” (teeny weeny airliner). In October, the couple returned from a trip to China, where they visited the Great Wall and other historic sites. Next on the agenda, Crim hopes to start a jazz band. And he is writing a book, adding to the seven books of upbeat and motivational essays he has published so far. Based on Crim’s continuing good health and zest for life, there are many more inspiring stories to come.